Zubrowka (aka Bison Grass Vodka) is a Polish delight. It is a rye vodka infused with Bison Grass (als known as Holy Grass or Sweet Grass). Very easy to make yourself. 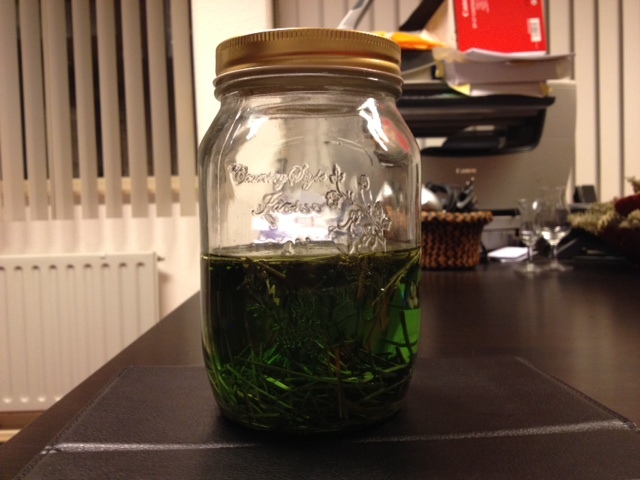 This post will focus on making the Bison Grass Essence, not on making rye vodka. Take 0.5 liters of 95% neutral hearts (or 95% rye vodka hearts) and put it in a mason jar. Cut 10 grams of Bison grass in pieces of between 1 and 2 centimeters (half an inch) and add them to the 95%. Now close the mason jar and warm up a few liters of water in a pan to approximately 70 degrees Celsius. Stop heating. Put the mason jar in pan with 70 degrees water (Au bain, Marie!) and let it sit there for 90 minutes. Stir the mason jar every 10 minutes. After the 90 minutes are done, take the mason jar out and let it cool back to room temperature. This will take another 1.5 hours. Next step? Filter the essence (dark green in color) and throw away the grass. You now have 0.5 liter of Bison Grass Essence. Add 20 mls per liter of 40% rye vodka, give it three days rest, and your Zubrowka is ready to drink!